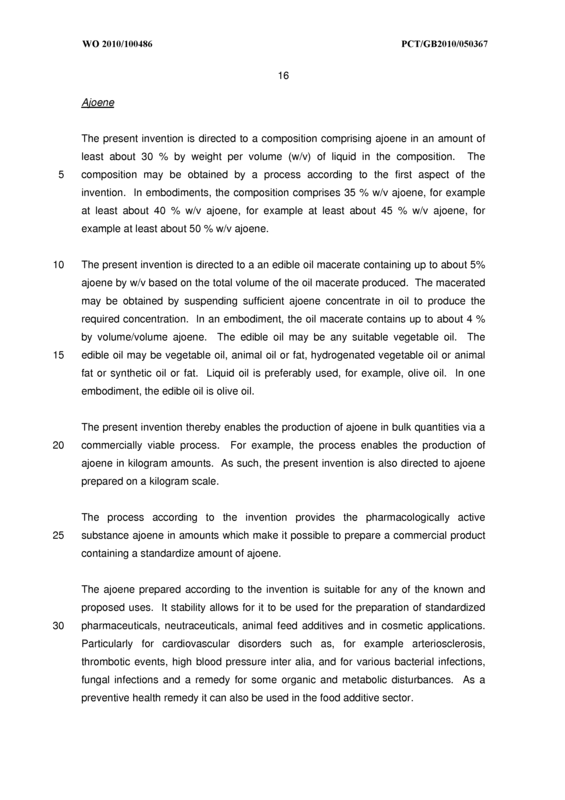 The present invention is directed to a process for the preparation of ajoene, and to ajoene having a relatively high purity which may be obtained by the process. 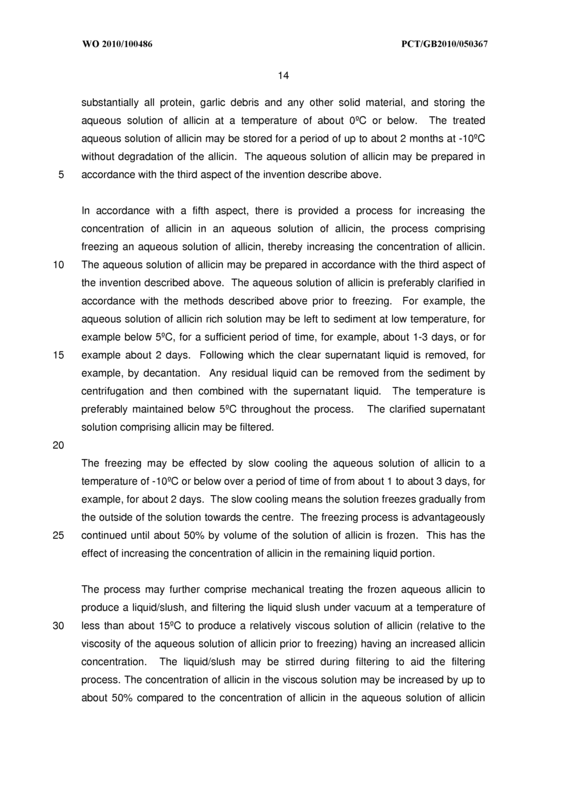 The invention also relates to processes for the preparation of allicin, to a process for freeze concentrating allicin. 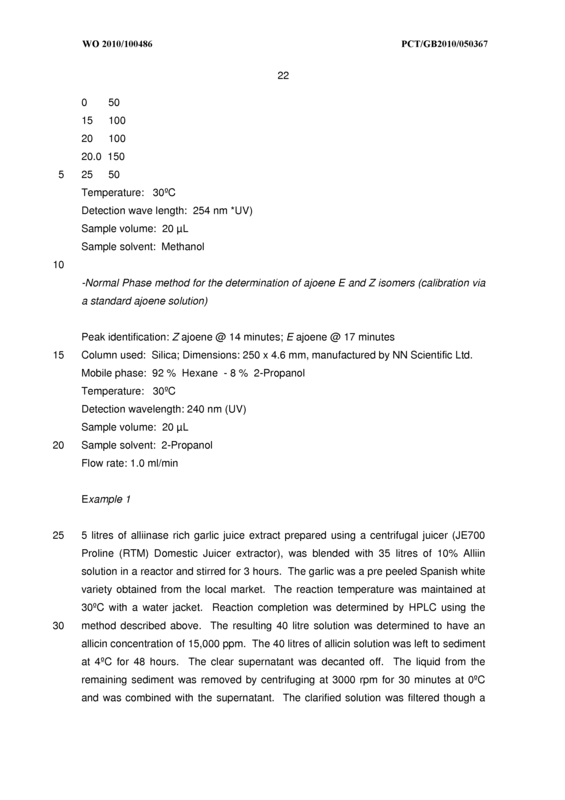 A process for the preparation of ajoene, the process comprising a step of heating an acidic solution comprising allicin for a sufficient period of time such that at least a portion of the allicin is converted to ajoene. 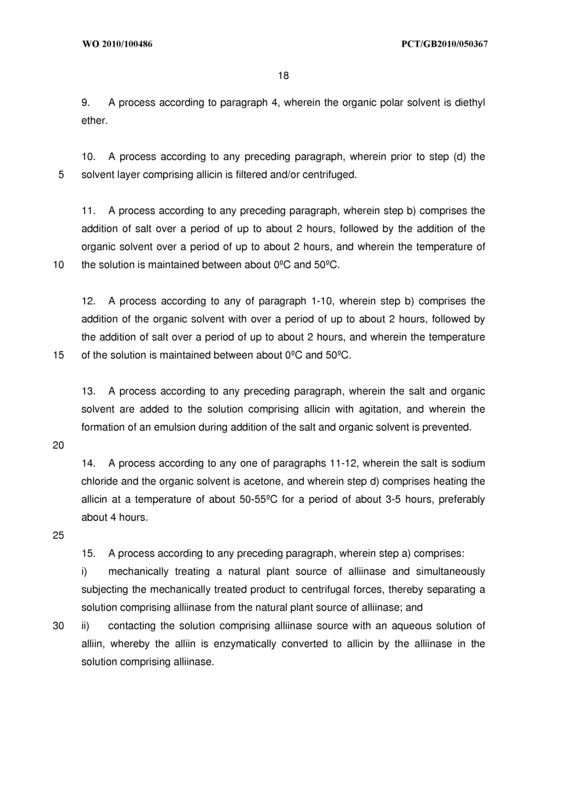 A process according to claim 1 , where the solution comprises an organic solvent and water. 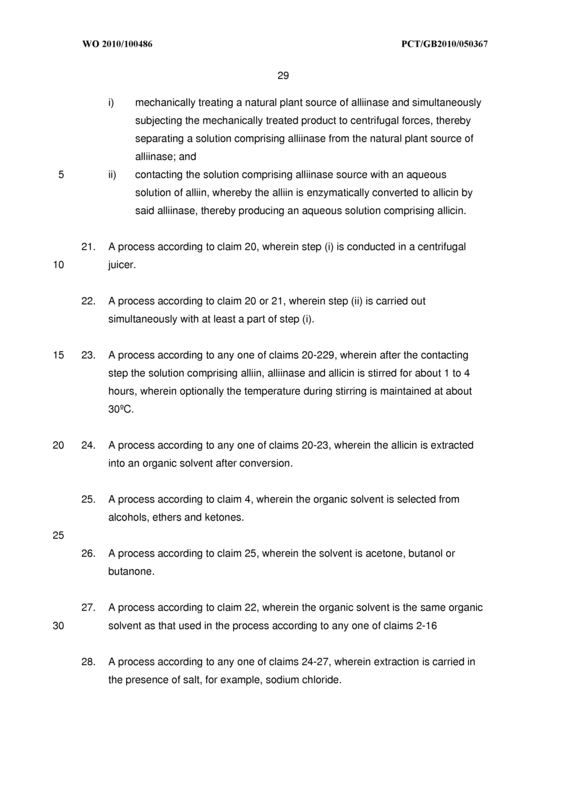 A process according to claim, 2 wherein the organic solvent in step is selected from alcohols, ethers and ketones. 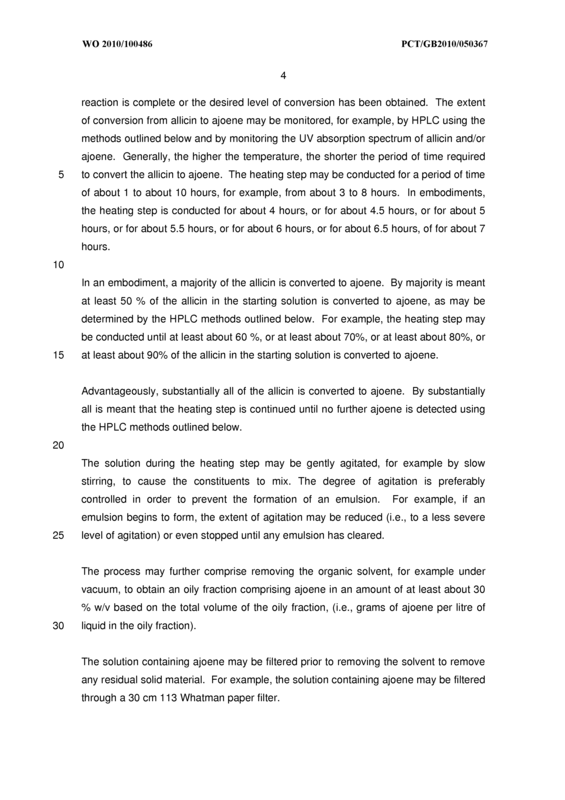 A process according to claim 3, wherein the organic solvent is acetone, butanol or butanone. 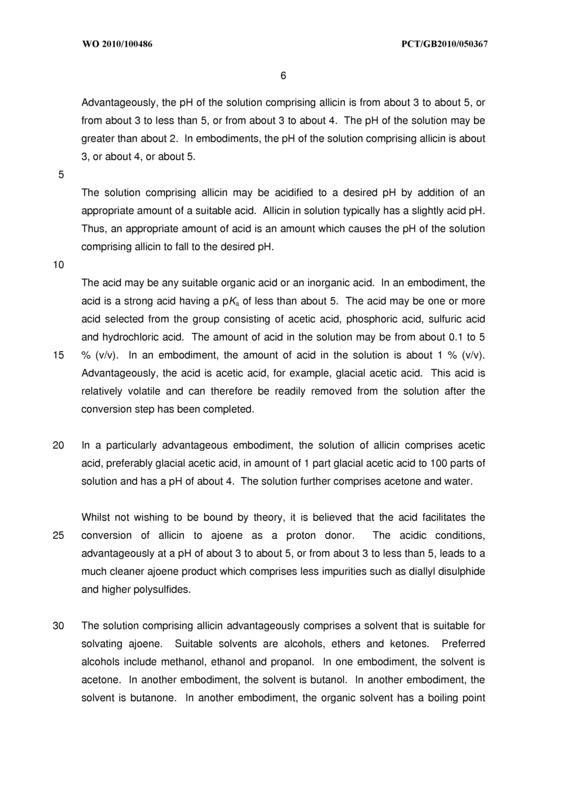 A process according to any preceding claim, wherein the acidic solution comprises an organic acid or an inorganic acid. A process according to claim 5, wherein the acid has a pKa of less than about 5. A process according to claims 5 or 6, wherein the acid is one or more acid selected from the group consisting of acetic acid, phosphoric acid, sulfuric and hydrochloric acid. 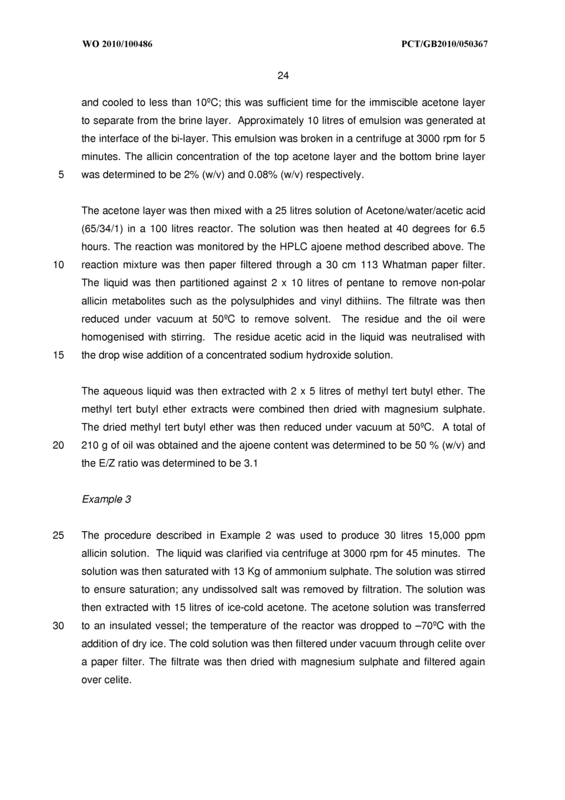 A process according to any preceding claim, wherein the amount of acid in the solution is from about 0.1 to 5 % (v/v). 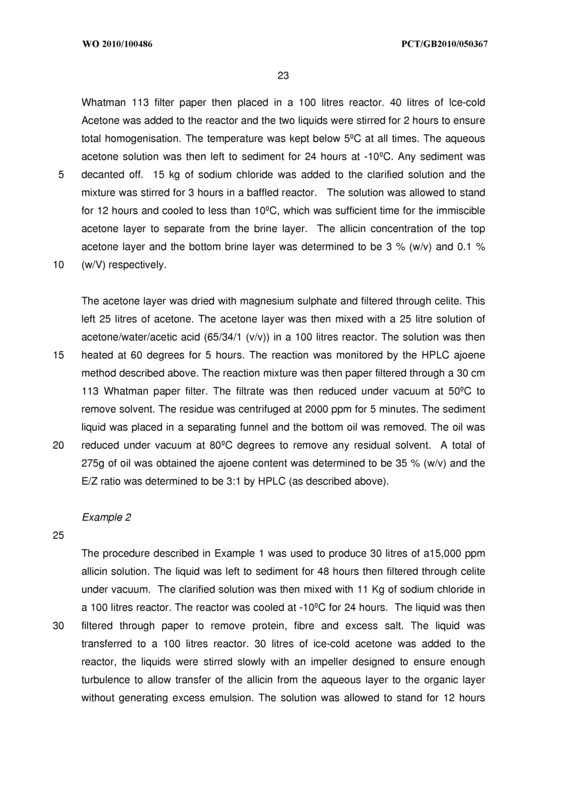 A process according to claim 8, wherein the amount of acid in the solution is from about 0.1 to about 1 % (v/v). A process according to any one of claims 2-9, wherein the amount of organic solvent is from about 50 to 70 % (v/v) with the balance water. 1 1. A process according to claim 10, wherein the acid is acetic acid and the organic solvent is acetone, the balance of the solution being water. A process according to any preceding claim, wherein the heating step is carried out at a temperature of from about 30QC to about 80QC. 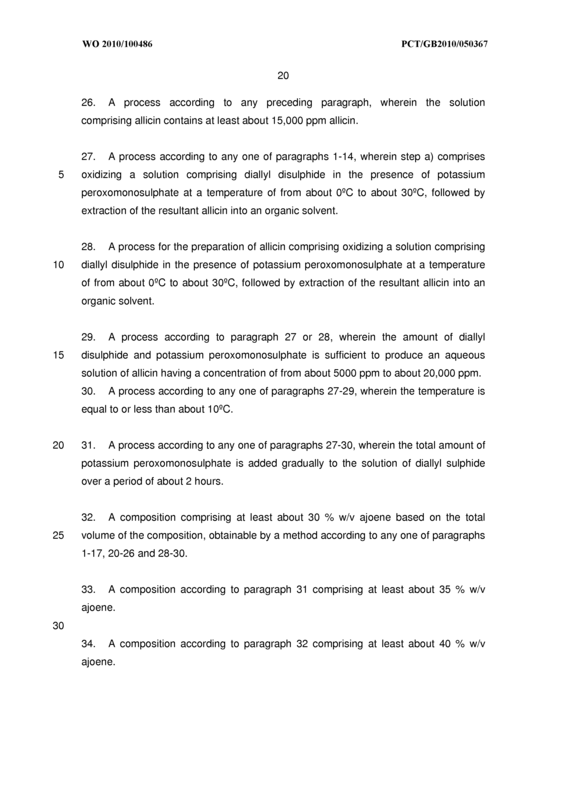 A process according to claim 12, where the temperature is about 40QC or about 50QC or about 60QC. 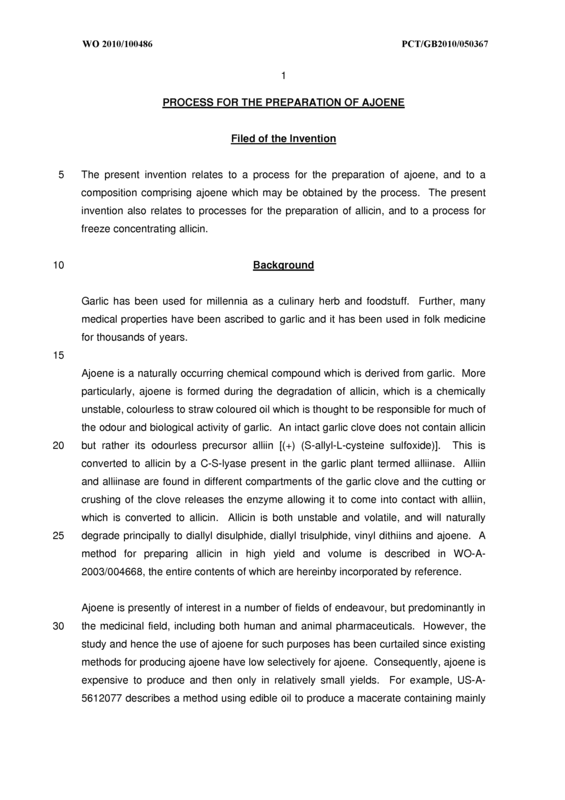 A process according to any preceding claim, wherein a majority of the allicin is converted to ajoene. 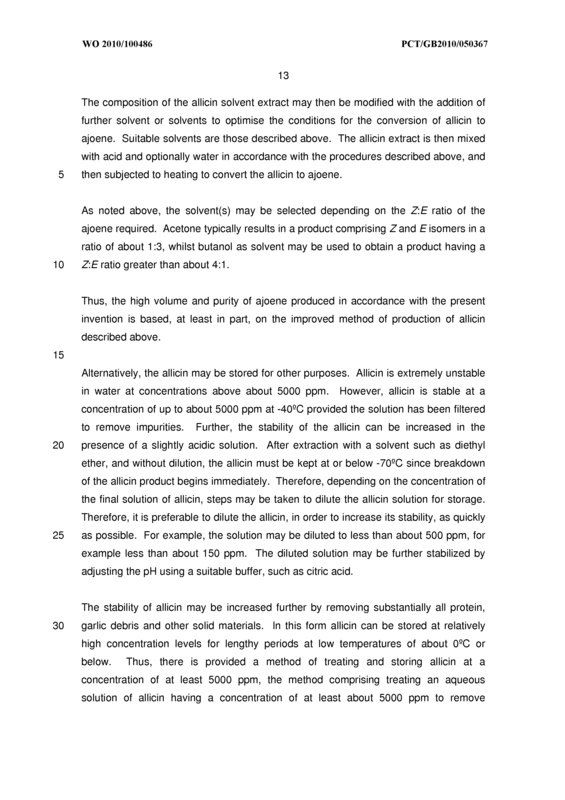 A process according to any preceding claim, wherein substantially all of the allicin is converted to ajoene. 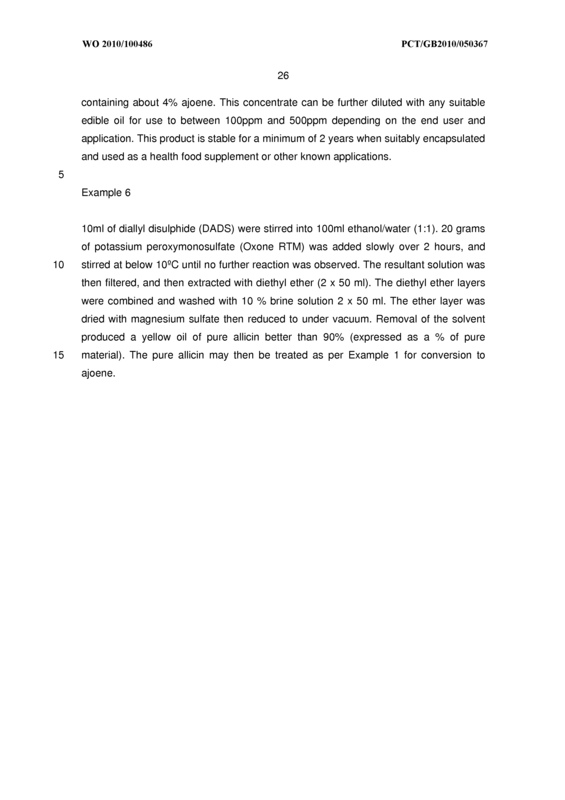 A process according to any preceding claim, wherein the acidic solution of allicin has a pH of from about 3 to about 5, or a pH of from about 3 to less than 5. 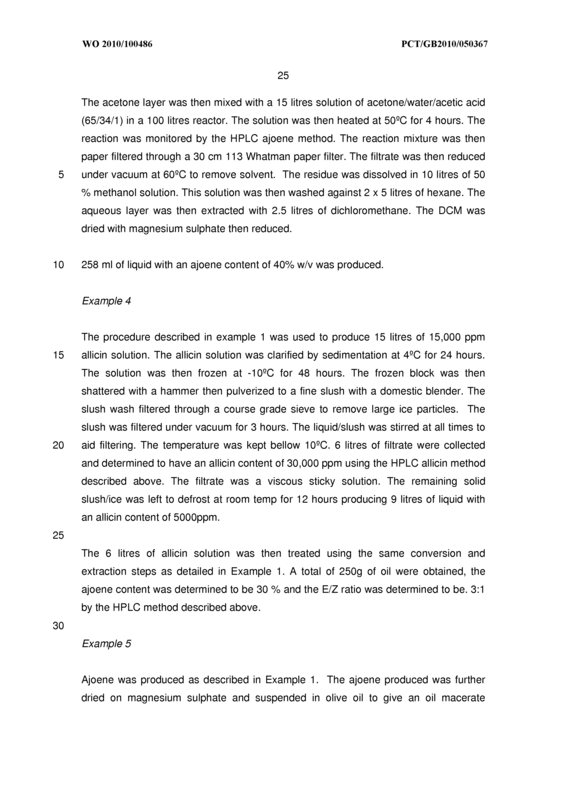 A process according to any preceding claim, further comprising removing the organic solvent to obtain an oily fraction comprising ajoene in an amount of at least about 30 % w/v based on the total volume of the oily fraction. A process according to claim 17, wherein the oily fraction is extracted with an organic polar solvent to remove residual organic solvent and dried to remove residual water. 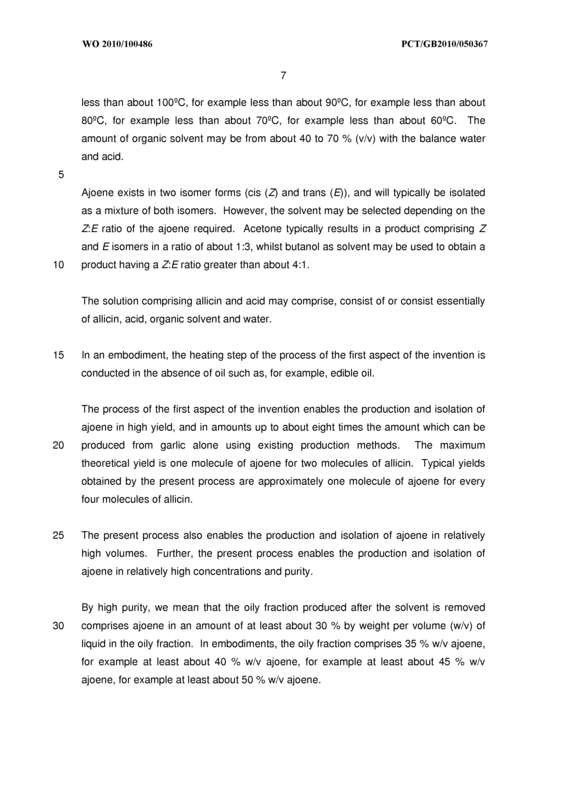 A process according to any one of claims 14 to 18, further comprising suspending the oily fraction in edible oil to form an oil macerate containing about 4-5% w/v ajoene based on the total volume of the oil macerate, wherein the edible oil is optionally olive oil. 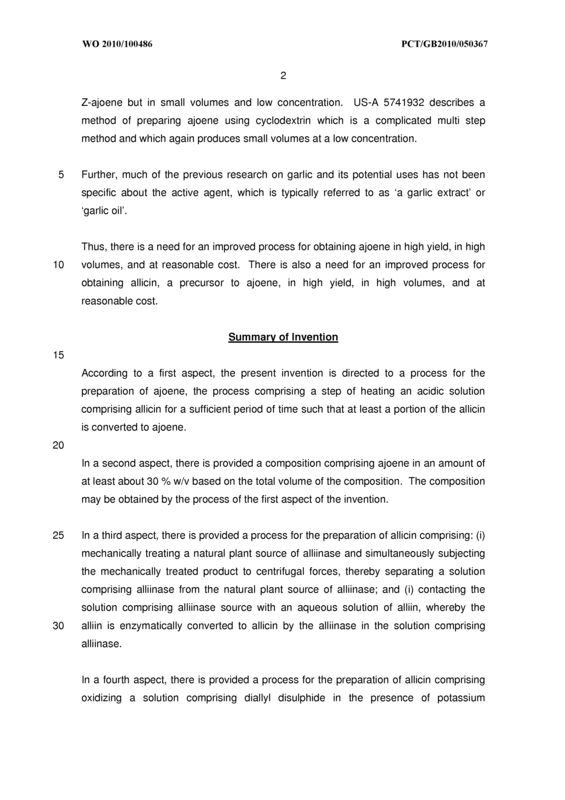 A process according to any preceding claim, wherein the solution comprising allicin is prepared by a process comprising: i) mechanically treating a natural plant source of alliinase and simultaneously subjecting the mechanically treated product to centrifugal forces, thereby separating a solution comprising alliinase from the natural plant source of alliinase; and ii) contacting the solution comprising alliinase source with an aqueous solution of alliin, whereby the alliin is enzymatically converted to allicin by said alliinase, thereby producing an aqueous solution comprising allicin. 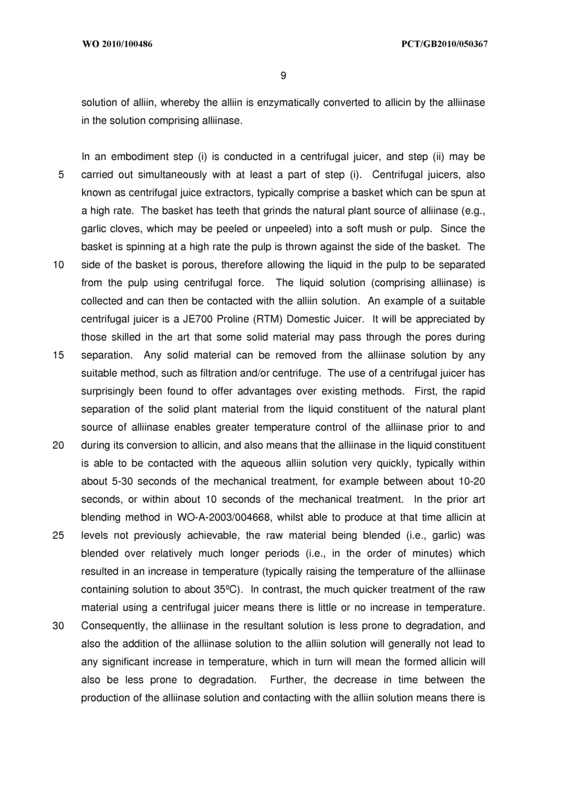 A process according to claim 20, wherein step (i) is conducted in a centrifugal juicer. A process according to claim 20 or 21 , wherein step (ii) is carried out simultaneously with at least a part of step (i). 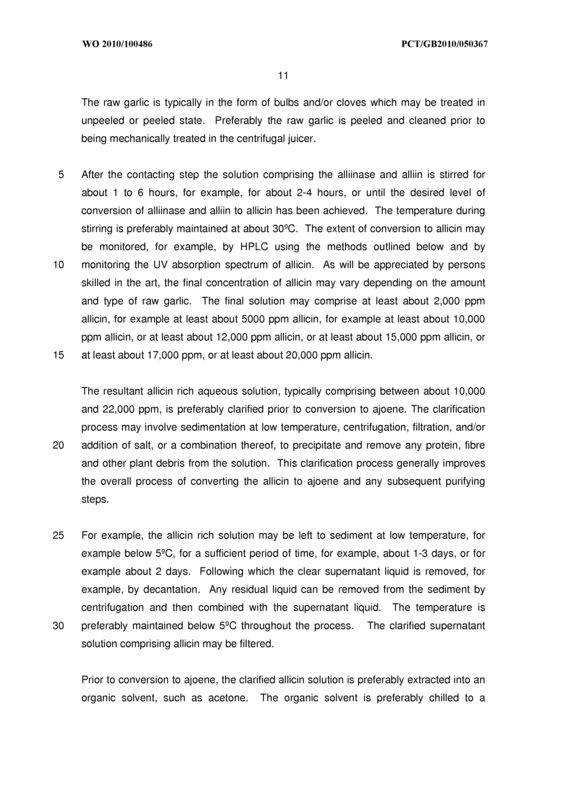 A process according to any one of claims 20-229, wherein after the contacting step the solution comprising alliin, alliinase and allicin is stirred for about 1 to 4 hours, wherein optionally the temperature during stirring is maintained at about 30QC. 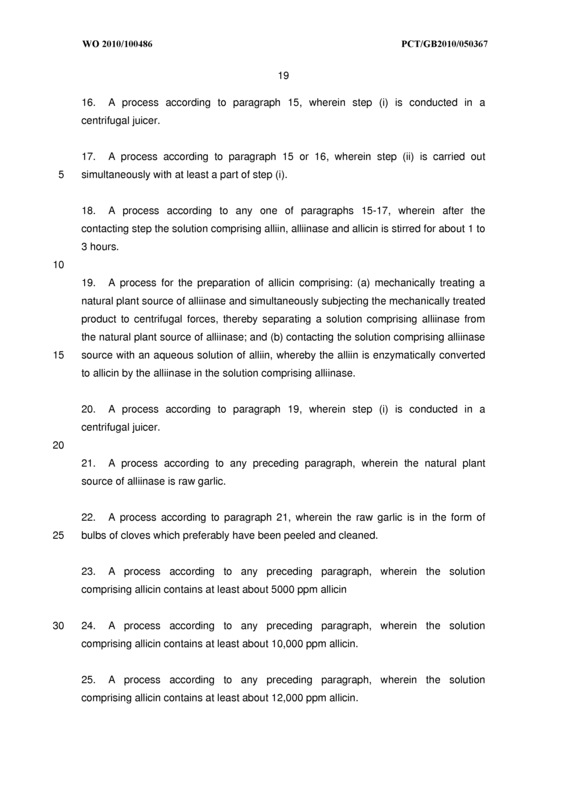 A process according to any one of claims 20-23, wherein the allicin is extracted into an organic solvent after conversion. A process according to claim 4, wherein the organic solvent is selected from alcohols, ethers and ketones. 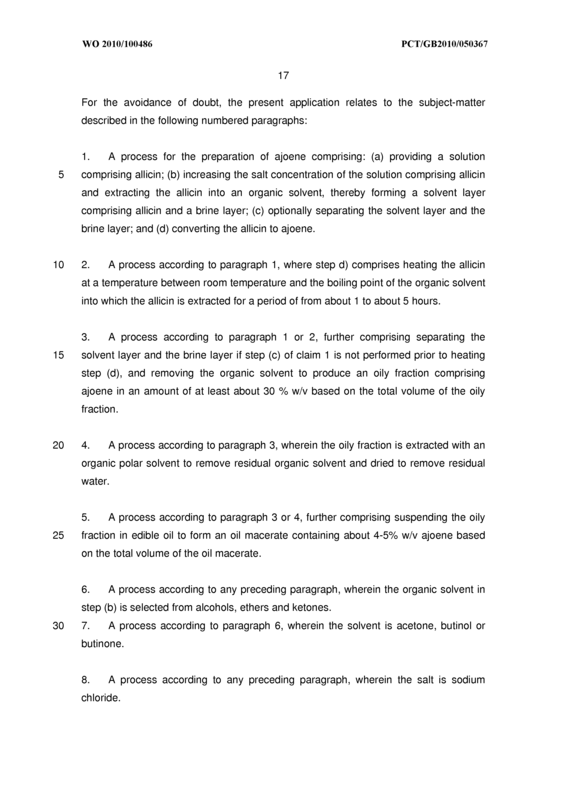 A process according to claim 25, wherein the solvent is acetone, butanol or butanone. A process according to any one of claims 24-27, wherein extraction is carried in the presence of salt, for example, sodium chloride. 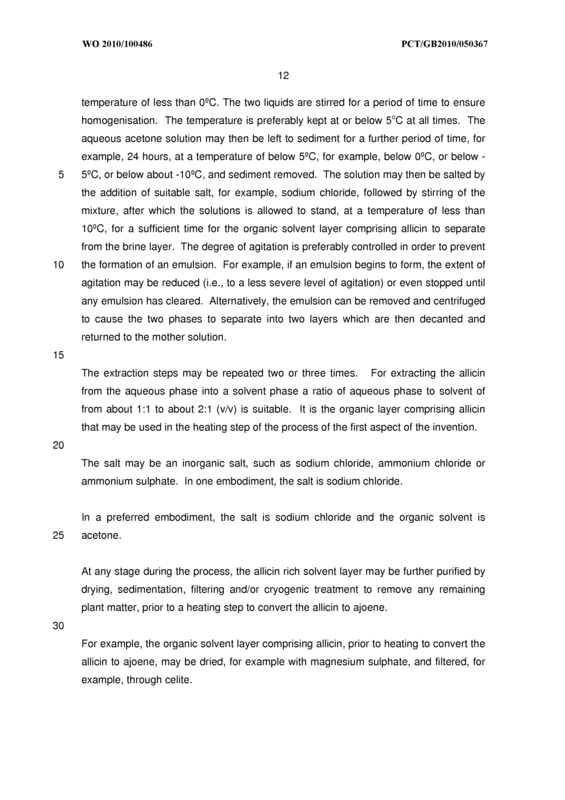 A process according to any one of claims 24-28, wherein the salt and organic solvent are added to the solution comprising allicin with agitation, and wherein the formation of an emulsion during addition of the salt and organic solvent is prevented or at least minimized. 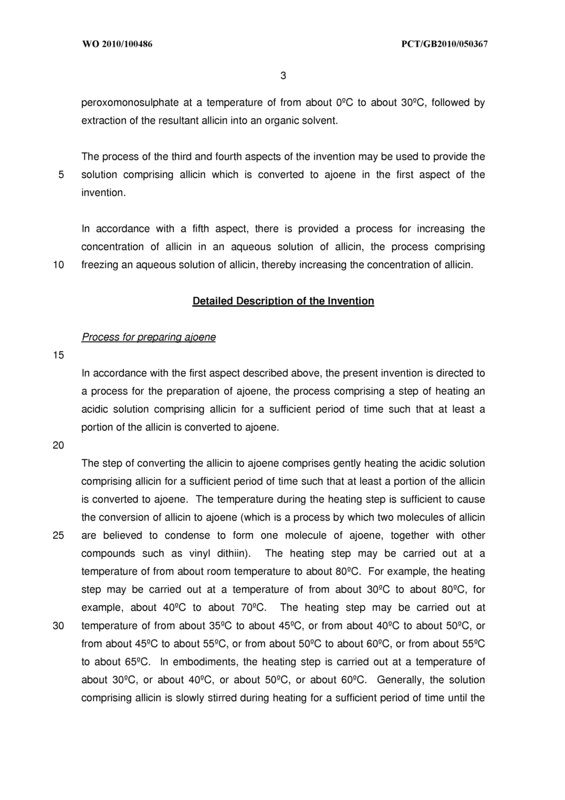 (b) contacting the solution comprising alliinase source with an aqueous solution of alliin, whereby the alliin is enzymatically converted to allicin by the alliinase in the solution comprising alliinase. 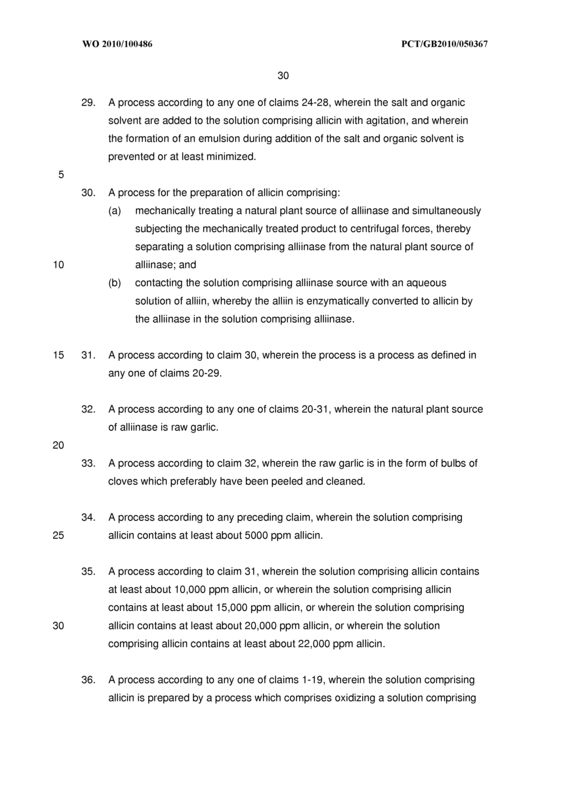 A process according to claim 30, wherein the process is a process as defined in any one of claims 20-29. 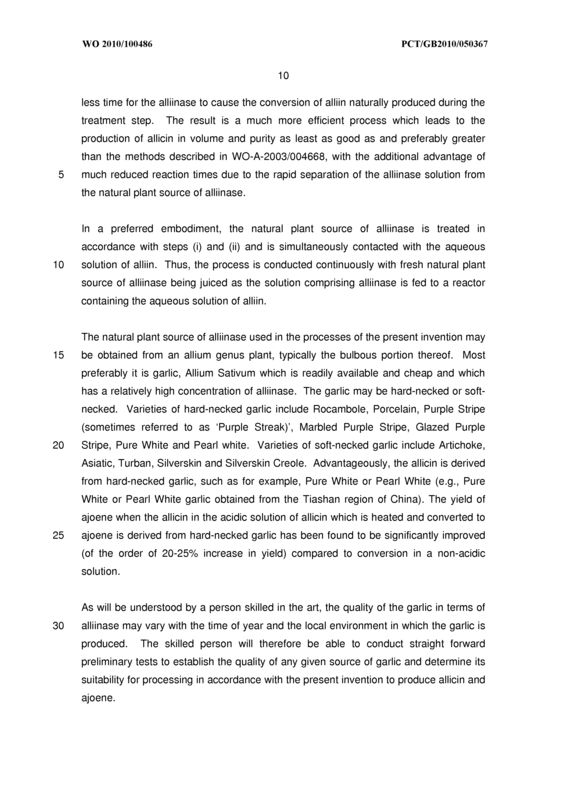 A process according to any one of claims 20-31 , wherein the natural plant source of alliinase is raw garlic. A process according to claim 32, wherein the raw garlic is in the form of bulbs of cloves which preferably have been peeled and cleaned. 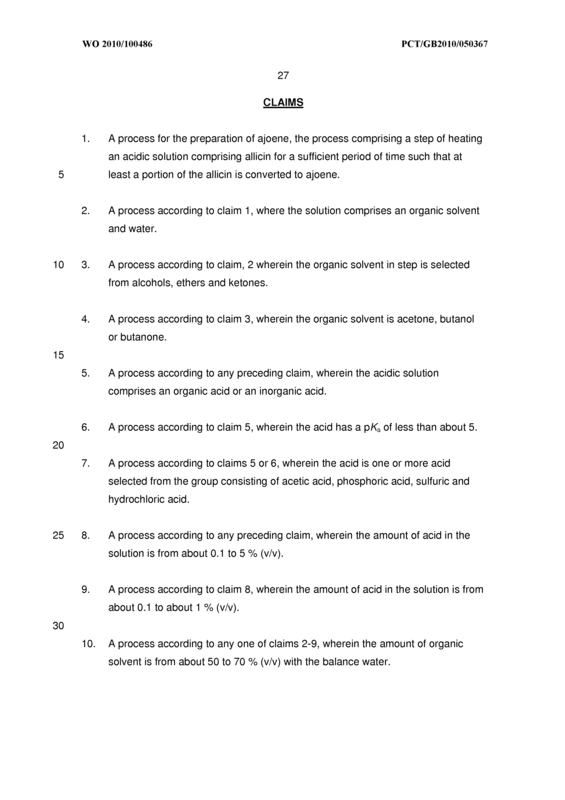 A process according to any preceding claim, wherein the solution comprising allicin contains at least about 5000 ppm allicin. 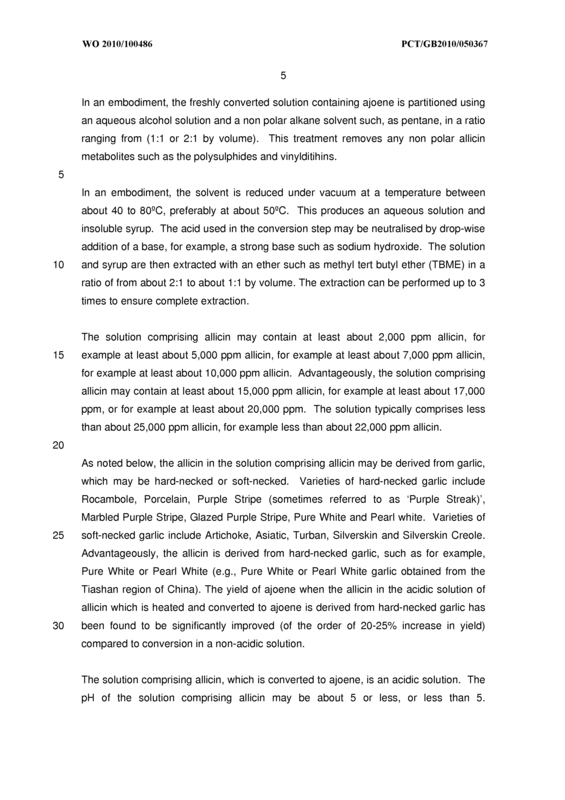 A process according to claim 31 , wherein the solution comprising allicin contains at least about 10,000 ppm allicin, or wherein the solution comprising allicin contains at least about 15,000 ppm allicin, or wherein the solution comprising allicin contains at least about 20,000 ppm allicin, or wherein the solution comprising allicin contains at least about 22,000 ppm allicin. 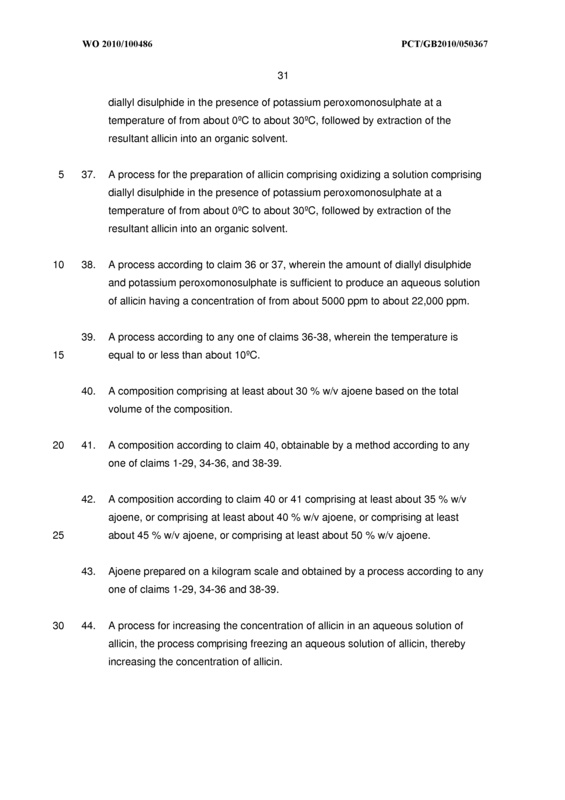 A process according to any one of claims 1 -19, wherein the solution comprising allicin is prepared by a process which comprises oxidizing a solution comprising diallyl disulphide in the presence of potassium peroxomonosulphate at a temperature of from about 0QC to about 30QC, followed by extraction of the resultant allicin into an organic solvent. 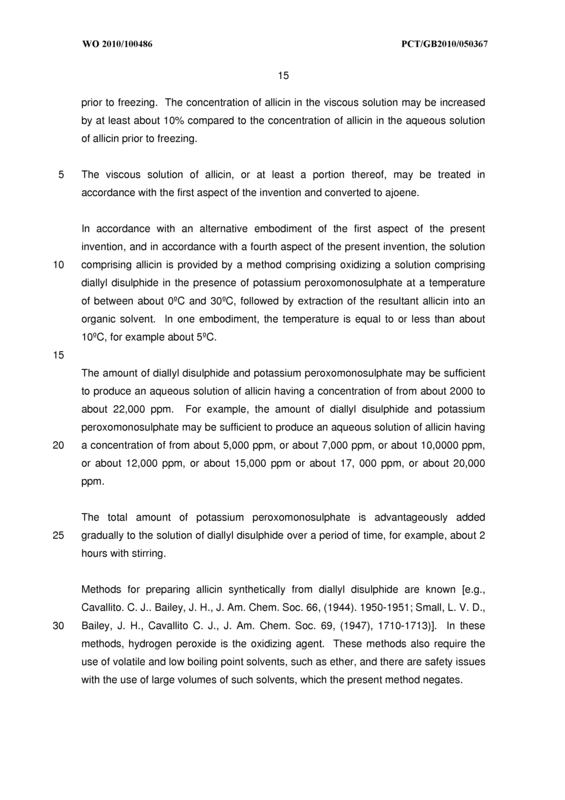 A process for the preparation of allicin comprising oxidizing a solution comprising diallyl disulphide in the presence of potassium peroxomonosulphate at a temperature of from about 0QC to about 30QC, followed by extraction of the resultant allicin into an organic solvent. 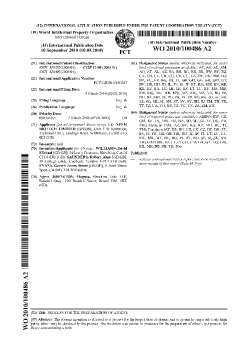 A process according to claim 36 or 37, wherein the amount of diallyl disulphide and potassium peroxomonosulphate is sufficient to produce an aqueous solution of allicin having a concentration of from about 5000 ppm to about 22,000 ppm. 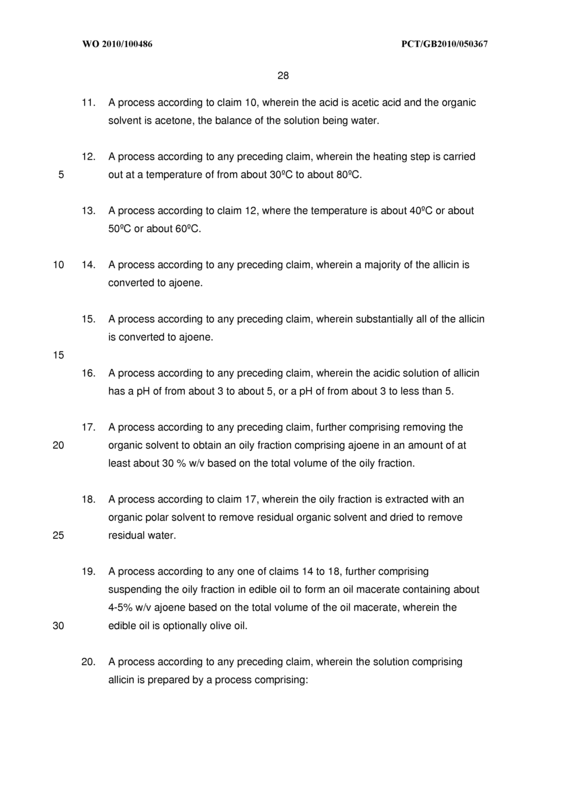 A process according to any one of claims 36-38, wherein the temperature is equal to or less than about 10QC. A composition comprising at least about 30 % w/v ajoene based on the total volume of the composition. 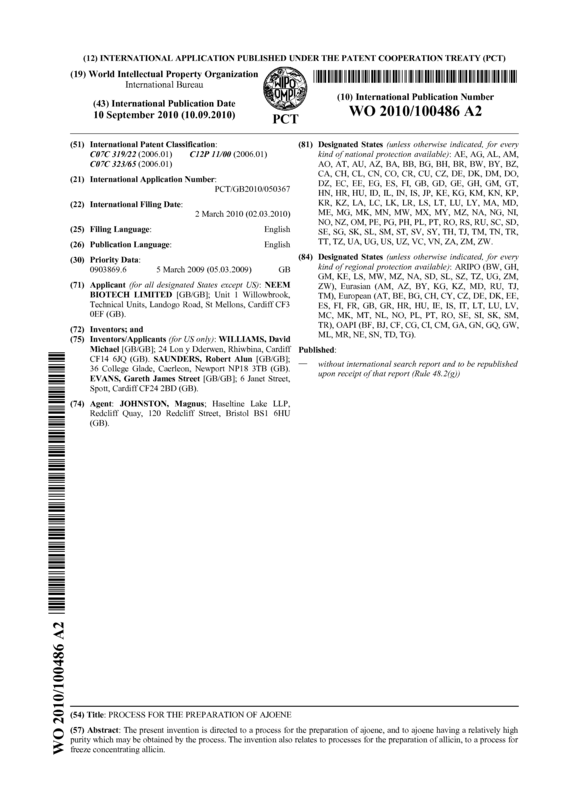 A composition according to claim 40, obtainable by a method according to any one of claims 1 -29, 34-36, and 38-39. A composition according to claim 40 or 41 comprising at least about 35 % w/v ajoene, or comprising at least about 40 % w/v ajoene, or comprising at least about 45 % w/v ajoene, or comprising at least about 50 % w/v ajoene. 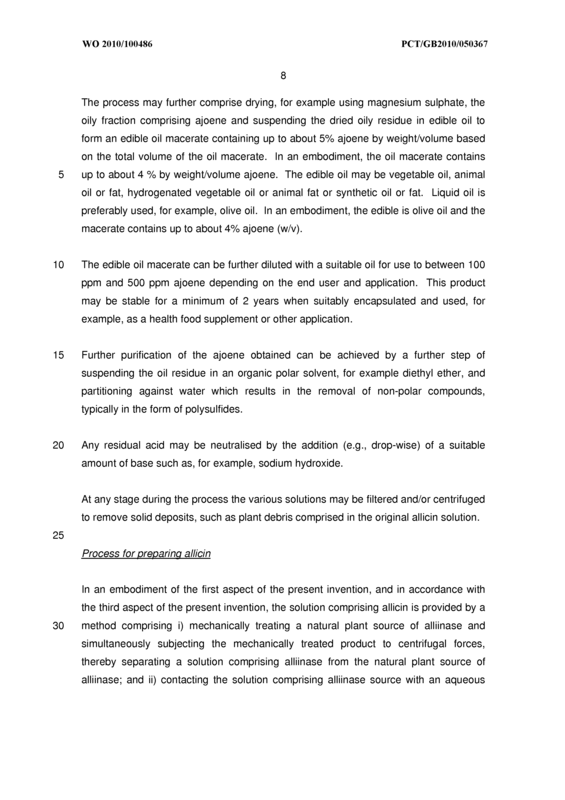 Ajoene prepared on a kilogram scale and obtained by a process according to any one of claims 1 -29, 34-36 and 38-39. 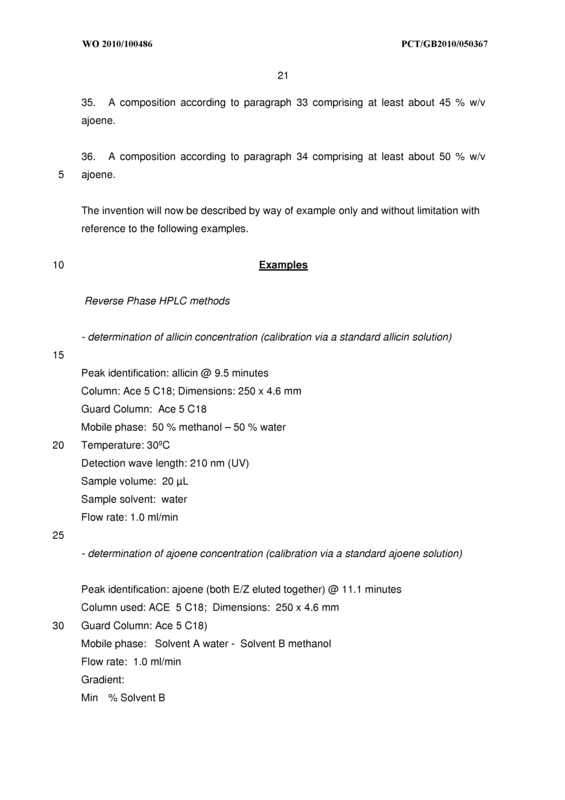 A process for increasing the concentration of allicin in an aqueous solution of allicin, the process comprising freezing an aqueous solution of allicin, thereby increasing the concentration of allicin.